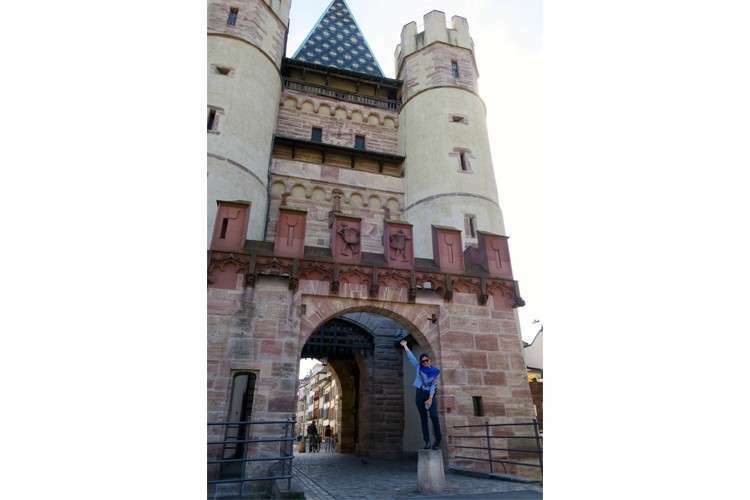 A SAGE traveler once advised us: “On long trips, mix big cities with small ones.” Thus, my husband Jovi and I found ourselves in Basel, Switzerland for a one-day stopover on our tour of Europe. 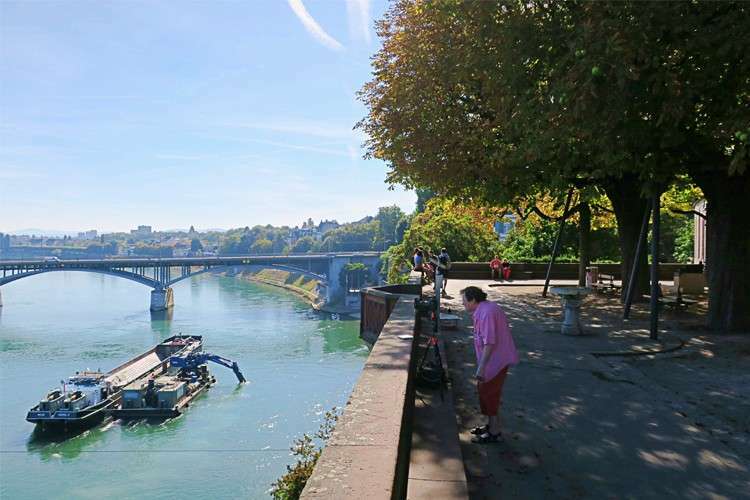 After a week of dodging pickpockets and swarming tourists in Paris, we walked out of the TGV Lyria high-speed train shocked by the clean and calm Basel. Tucked away in the northern edge of Switzerland, Basel is so close to Germany and France that it almost seems like it’s kissing both of them on the map. Thanks to its location along the Rhine River, it is a hub of transportation and trade in Europe. So here we are, in a city known among art and culture lovers for its iconic Art Basel, architecture and museums, yet my husband had only one thing in mind. “I want to go to Roger Federer’s house,” he said. “He’s from here, but I don’t think he lives here,” I replied. We scratched the idea of taking a pilgrimage to Federer’s house. 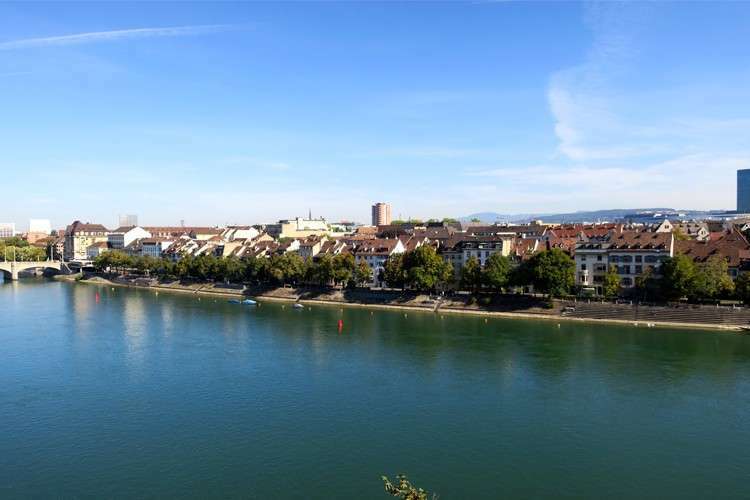 Devoid of any itinerary, we turned to the trusty internet for things to see and do in Basel. Within minutes, I found a TripAdvisor comment about a DIY walking tour of the city’s historic center. 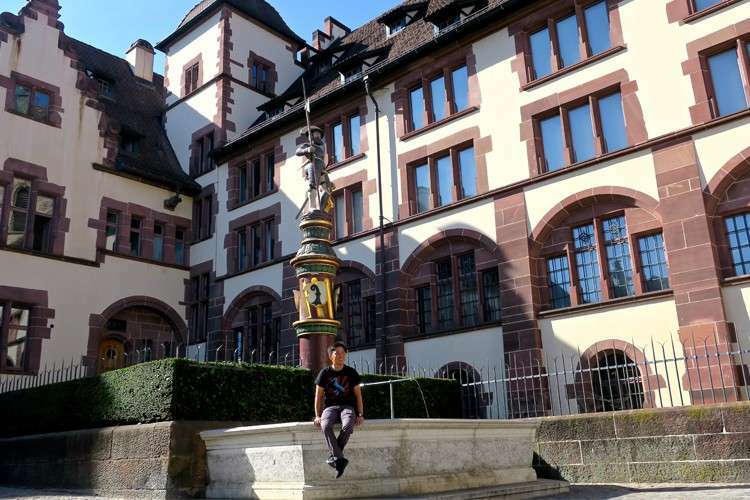 “If you follow this tour, you’ll be able to see Basel’s most important historical sights in just two hours,” it said. “There’s no need for an expensive tour guide.” What could go wrong from following advice on the internet? A word about Basel’s trams – they operate on an “honor system”, which means that passengers can ride without swiping tickets they should already have. This is unfamiliar to me as a Filipino, so I clutched my Saver Day Pass (free one-day transport throughout Switzerland) even though I don’t need to show it. The first stop on the walking tour was Mittlere Brücke (Middle Bridge), built in the 1200s and one of the oldest river crossings anywhere on the Rhine. 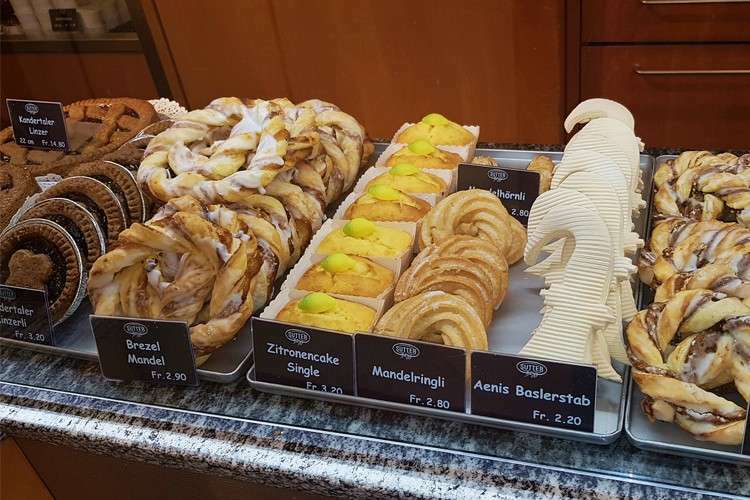 We grabbed chocolate cakes in the nearby Sutter Begg bakery, which we ate while staring at Käppelijoch, a replica of the old bridge chapel. Today, Mittlere Brücke is one of the few bridges in the world with a chapel in the middle. It’s one of those glorious mornings when everything seems to glow from within: the riverboats sailing the Rhine, smoothly ferrying passengers; smiling locals offering directions; and the old and new buildings in Basel, beaming under the autumn sky. 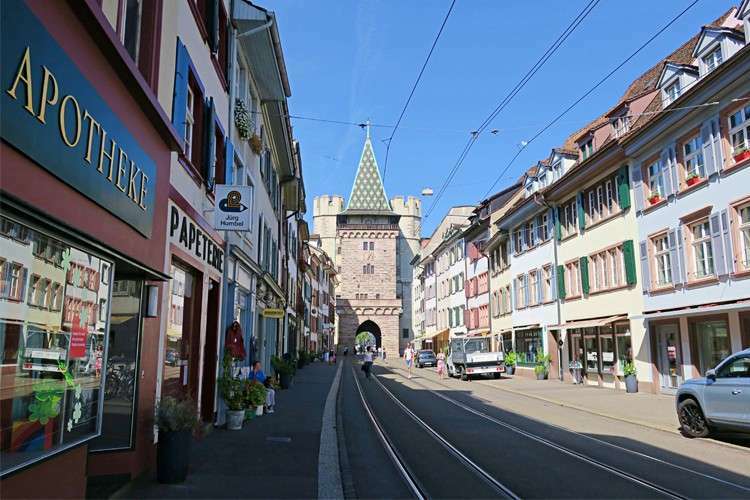 We start walking toward the tall, red, twin spires of Basler Münster, Basel’s famous cathedral. The city of Basel was born at Minster. The enormous, 800-year-old red-sandstone cathedral perched on a hill was the seat of bishops during the Middle Ages. Children’s laughter echoed off the adjacent playground in the square where the Romanesque cathedral stands today. We walked to the nearby Pfalz viewpoint, where one can see the border where Switzerland, France and Germany meet. There was hardly anyone on the elevated terrace while we enjoyed a commanding view of the Rhine. 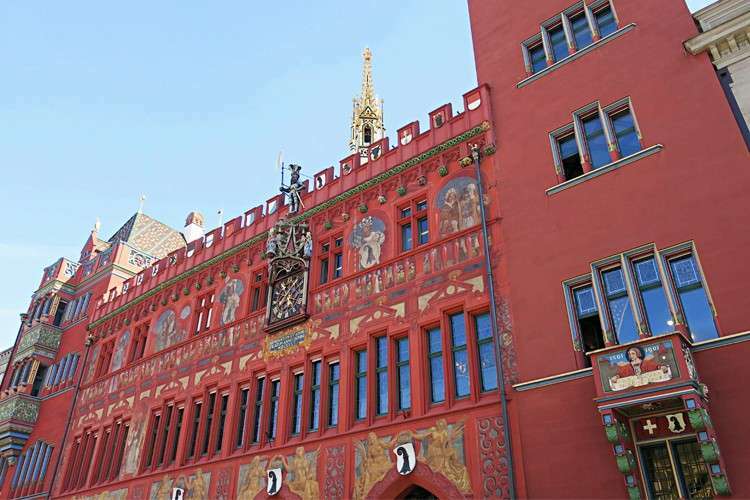 Basel’s Old Town is known as one of the most well-preserved, picturesque old towns in Europe. It’s a joy to walk along its steep cobblestone streets that are sometimes so narrow that there’s barely space for two pedestrians. 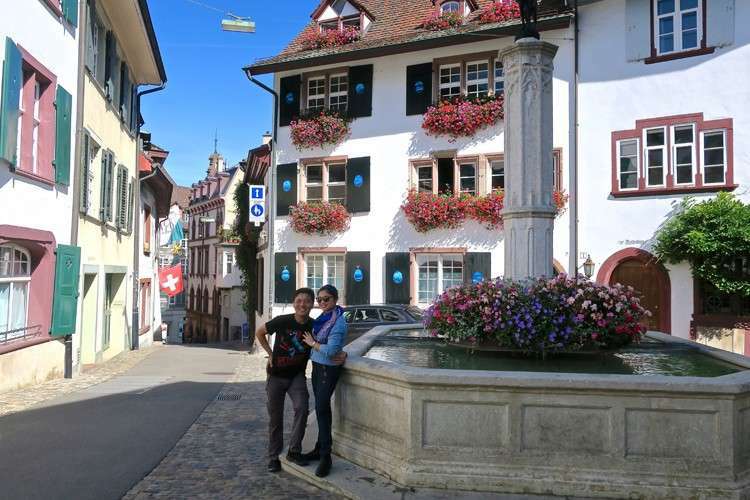 Blooming geraniums on window sills add color to 14th-century half-timbered houses. 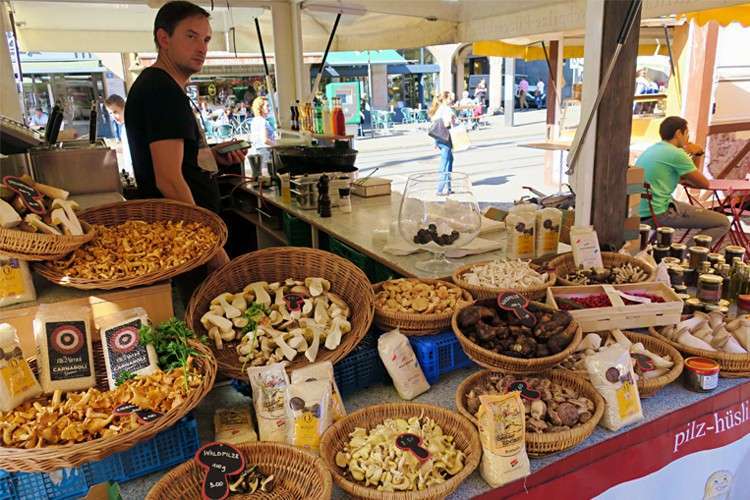 After taking about 300 street photos, we arrive at Marktplatz (Marketplace) with its daily flower and food market. Dominating the marketplace is the Rathaus (Town Hall). Painted blood-red with gilded ornaments, I couldn’t unsee this massive, 16th-century structure. It’s topped by a giant tower with a clock from 1511. Between streets called Imbergasslein (Ginger Alley) and Nadelberg, we found shops selling P1.2 million watches and P40,000 leather belts. Then, we came across a store we could actually afford to shop in, Johann Wanner Christmas House. 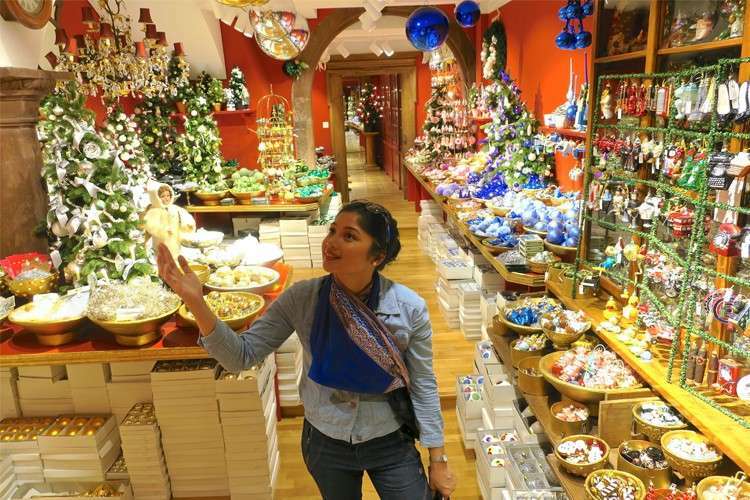 “Where celebrities and royal families all over the world buy their Christmas ornaments,” described the tourism brochure. We ogled at thousands of glass and silver decorations in all shapes and sizes. 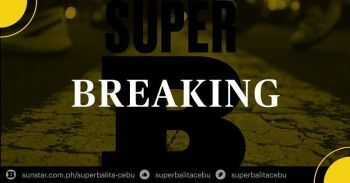 We were pleased with our purchase, a four-inch Eiffel Tower, the symbol of France made as an ornament in Poland then sold in Basel to be displayed in our house in Cebu. Our very last stop is Spalentor, one of the three surviving gates from the Middle Ages that marks the city’s former fortifications. By this point, we were giddy with what turned out to be a spectacular walk in Basel’s historic center. Serendipity and luck blessed us in this one-day adventure of Basel, like two faces of a coin that somehow turned up at once. We hopped on the tram back to the train station, thankful for a sneak peek into Basel’s venerable past.